The funds donated are used to purchase medical equipment to outfit the local hospitals as well as procurement of medical supplies that enable us to carry out our mission. We like to stock up their shelves with much needed supplies. Paypal processes donations for HART, a 501(c)3 charity. You can complete your gift those in need in Africa with just a few clicks. You will receive a thank you letter & receipt if over $25. One example of equipment outfitting was when HART placed a much needed orthopedic rodding system in Kakamega, Kenya. The system permitted our surgeons to place about 24 rods in broken femurs that let 24 patients go home that week as opposed to lying in traction for 3-8 months or longer under normal circumstances. That system, known as the Sign System, cost $20,000.oo. Sign System is a humanitarian group that, once the system is purchased and placed, will provide metal rods for life to those communities. An Invaluable purchase that has put in place a system to continue to offer medical services for a lifetime. All of this because of the kind hearts of those who have donated. HART has overseen the construction of the Adenkyira Medical Clinic through your generous donations. The entire donation of $25,000.oo went to the construction of the clinic. We are looking to build another in Beposo, Ghana next year. This truly leads to sustained healthcare. 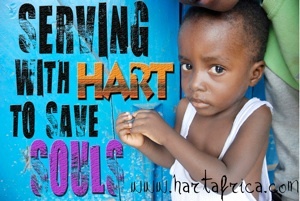 Thanks for taking time to read about HART and we hope you will in some way participate. It really does make a difference in at least two lives - yours and those whom you have generously touched.